Two brightly colored cats are standing under an umbrella. 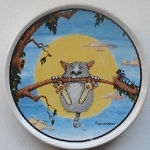 This Laurel Burch cat magnet is 3 1/2" wide x 2 1/2" high. Message is: It's not about avoiding the rain...it's about who you share your umbrella with.